Did the Falkland Islanders only have peat as fuel until the arrival of the Argentine oil companies? I found this paragraph in the Spanish wikipedia entry about peat. 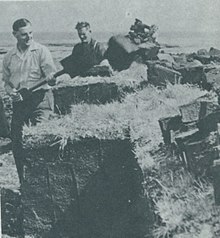 A group of Falklanders shoveling peat around the 1950s. Peat was the only form of fuel used in the Falklands until the arrival of the Argentine companies YPF and Gas del Estado. Ortiz de Rozas, Carlos (21 de junio de 2006). «Historia Oficial británica sobre las islas Malvinas: análisis crítico». Anales de la Academia Nacional de Ciencias Morales Y Políticas: 36. ISSN 0325-4763. But I find this assertion hard to believe, since the islands had a strong British military presence since 1982 and that entails a strong logistical effort (and a lot of fuel) that must have necessarily benefited the locals. I can't find anything on the strong claim that Falkland Islanders only had peat as fuel. So this isn't a complete answer. However official government publications do support the idea that peat was a major fuel source on the islands until around 1982 and before that from 1974 by treaty the Argentinian state oil company had a legal monopoly on importing oil to the Falklands and prior to that commerce was partly restricted. peat is very common on the Islands and provided warmth for almost every household for the first hundred or so years of British rule. Although effectively free, cutting peat was a laborious task and once it was dried it was not a particularly efficient fuel. In Stanley a public holiday was designated for the work. Since the 1982 Conflict peat has largely been replaced by fuel oil. In 1974 a ‘sovereignty umbrella’ was introduced to cover all possible commercial transactions and it was under this that the supply of fuel to the Islands was given as a monopoly to the Argentine state oil company YPF. Stanley before the Argentine invasion was a town in decline. Access to the Falklands was effectively controlled by LADE, the commercial arm of the Argentine air force, which provided the only regular link to the outside world. The Argentine state oil company, YPF, provided all the Islands’ fuel. It seemed that the Falklands were sliding into the arms of Argentina. Emigration, to the UK or New Zealand, increased and the birth rate fell. The population of the Islands declined to 1,800. It took the events of 1982 to reverse the trend. Not the answer you're looking for? Browse other questions tagged energy lifestyle .